Sonoma-Style Chinese New Year, Mangalitsa Dinner, Cheesefest, Yountville Live! Egg puffs at Quickly, which recently opened in Santa Rosa. Photo courtesy of Heather Irwin. Mini octopus from Quickly, in Santa Rosa. Photo courtesy of Heather Irwin. Woolly mangalitsa pigs at Winkler Wooly Pigs in Windsor, California. Owner Tim Winkler supplies many of the local restaurants with meat. Photo courtesy of Tim Winkler. 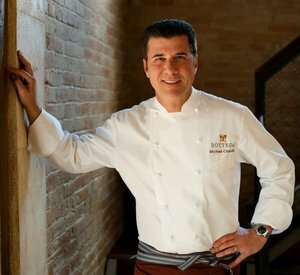 Chef Michael Chiarello of Bottega Restaurant in Yountville is among the all-star lineup at Yountville Live! Photo courtesy of Michael Chiarello. Thursday marked the first day of the Lunar New Year, a two-week festival of food and family. The spring celebration ushers in the promise of good fortune with steaming bowls of noodles, whole fish, sweets, citrus, and other “lucky” delicacies. This is the year of the goat, an animal that’s notorious for its appetite. (Okay, some say it’s the year of the sheep, which eat a lot too.) We say that’s good enough reason to break out of your sweet-and-sour pork rut and try something new at some of Sonoma County’s favorite Asian eateries. Deep-fried foods and egg puffs at Quickly: Based in Taiwan, this wacky fast-food transplant is all about the tea—be it green, black, flavored with roses, coffee, red beans, or waxed gourds—supplemented with tapioca boba or grass jelly. Just dive in, because it’s all an adventure. 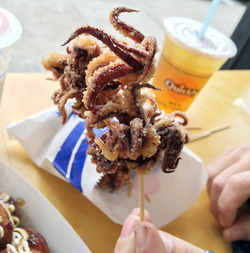 There’s also an eye-popping menu of deep-fried items including mini octopus, tofu, and fish balls, which are pressed bits of fried fish, and not part of the fish’s, uh, reproductive anatomy. If you’re a little unsure about trying new flavors, go with the egg puffs. 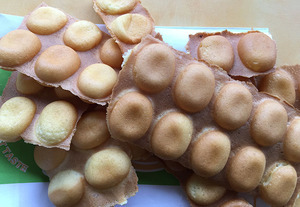 Though they look like bubble wrap, the taste is similar to a really eggy waffle. Expect a line of hungry Santa Rosa Junior College students ahead of you. 1880 Mendocino Ave., Santa Rosa. Steamed bao, pork belly, and barbecue pork at G+G Market: This local market is an under-the-radar gem for all things Chinese—at a great price. We’re huge fans of the steamed bao and barbecue pork, available in the deli. You can also find just about any Asian ingredient, from lychee jelly to black bean paste and dried shrimp, in the extensive grocery section. 1211 W. College Ave, Santa Rosa; and 701 Sonoma Mountain Parkway, Petaluma. Chicken feet and tofu skin at Hang Ah: Dim sum fans agree that this is the best in the North Bay. The menu is massive, and chances are you won’t recognize about half of the small plates. But at just $2-$4 each, it’s worth some experimentation. Chicken feet are exactly that. They’re a huge delicacy, and folks raised on ‘em swear by them. Personally, I’m not a fan, but I did try one. Tofu skin? Sounds weird, tastes incredible. 2130 Armory Rd., Santa Rosa. Cantonese roast duck and mapo tofu at M.Y. Noodles: Martin Yan’s noodle shop at the Graton Casino is a hugely overlooked restaurant with really solid (and authentic) Chinese favorites. We really like the hoisin-glazed roast duck and mapo tofu. 288 Golf Course West Dr., Rohnert Park. Hot and sour soup at Kirin Restaurant: I’m a recent convert to hot and sour soup, over my usual wonton. Filled with wood ear mushrooms, bamboo shoots, feathery bits of egg, and with a spicy kick, it’s my new alternative to chicken soup when I’m ailing. 2700 Yulupa Ave., Santa Rosa. Bakery goodies from East Wind Bakery: Just about everyone who’s been to this charming little Asian bakery has raved about the baked bao in flavors like kimchi-sausage and curried beef, along with Chinese sponge cakes and taro buns. I’m also gaga for their milk bread. 3851 Sebastopol Rd., Santa Rosa. Goji Kitchen: This Pan-Asian restaurant has become a junior college-area staple because of its extensive menu of Chinese, Thai, and Vietnamese dishes and also because of their dedication to fresh, often organic products and an extensive vegetarian selection. Though its not exactly authentic, you’ve gotta try the walnut pineapple prawn (the best in the area, hands down), along with clay pot rice and housemade pot stickers with ginger-garlic sauce. 1965 Mendocino Ave., Santa Rosa. Cheese lovers unite at Sonoma’s Artisan Cheese Fair, happening all weekend! This intimate cheese festival is at the cooking school Ramekins. Sunday’s gathering is one of the best opportunities to get face-to-face with the Bay Area’s artisan cheesemakers. Cheesemonger Sheana Davis of the Epicurean Connection hosts the annual event, which includes a mac and cheese cook-off, cheese tastings, and beer, wine, and cider tastings, plus guest chefs, live music, and of course, cheese wheel races. $50 per person, 21 and over. Trust us, you won’t walk away hungry or thirsty. Tickets available online. 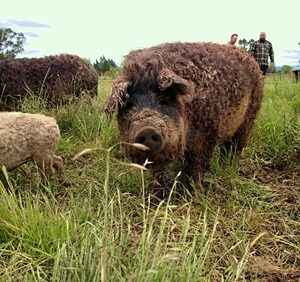 If you haven’t heard about the mangalitsa pig, you should. This prized, woolly breed is fatty and flavorful, and definitely not “the other white meat.” A number of chefs are now offering the prized pork on their menus, but by far the best mangalitsa-centric (secret) feast we’ve seen lately is this Tuesday February 24th at the Epicurean Social Club/Matrix Winery dinner in Santa Rosa. Feast on charcuterie, pork rinds with pork lard, pork sliders with saffron rouille, pork jowl bacon, pork belly sous vide, pork tenderloin with vanilla bean sauce, leaf-lard cocoa nib cookie sandwiches, and of course, a bacon-chocolate brittle goodie bag. $95 per person includes wine; tickets online. Yountville Live: From March 19 to 22, Napa’s toniest town hosts an intimate lineup of top music performers, restaurants, and wineries for Yountville Live! The four-day event includes concerts, winemaker dinners, wine tastings, and more. Expect more than 20 musical acts (Aimee Mann, Colbie Caillat, and O.A.R. ), 15 restaurants (Bottega, Hurley’s, Lucy, Brix), and 30 wineries (Jessup Cellars, Hill Family, Ma(i)sonry). There’s also a gospel brunch and the Taste of Yountville. Tickets range from a hefty $1,500 for an all-access pass to $450 for a music pass and $85-95 for concert tickets. Details and tickets online. Still hungry? Check out BiteClubEats.com for even more delicious North Bay food news.